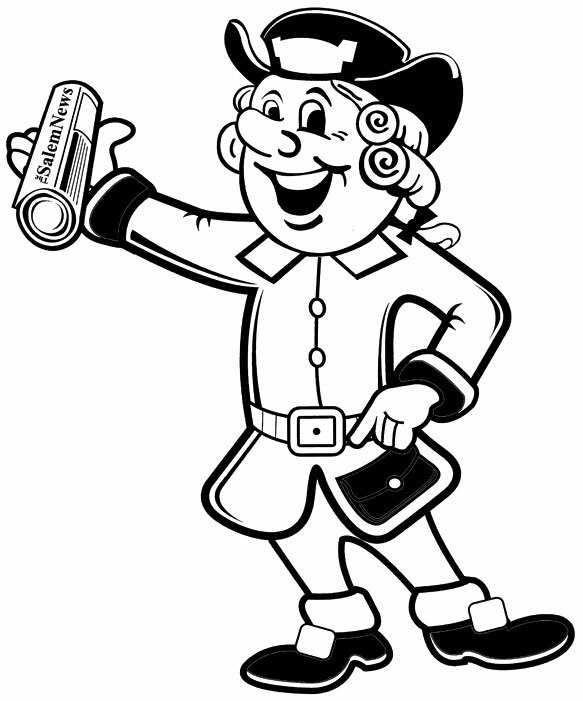 Download an image of Quaker Sam to color or Submit information about Quaker Sam to our Virtual Newsroom. One Sunny day, Quaker Sam at the Salem News, read a story about his friend, Flat Stanley. In the story, Flat Stanley was being shipped all over the world where he got to do and see many amazing places and meet so many excited people. In the story, Flat Stanley was vacationing in Florida, where he swam in the beautiful, blue ocean and made sand castles on the white sandy beaches. Quaker Sam who really only gets to meet people during parades, school visits, decided he wanted to visit his friends in Florida and have some adventures of his own. As the papers were rolling off the presses, the big machine that prints the newspapers- Quaker Sam saw the weather page and wanted to know if he should bring his swim trunks or a sweater to the Sunshine State. As Quaker Sam got closer to check the weather page, his hat fell into the pages rolling off of the machine. When Quaker Sam reached for his hat, he accidentally fell into the presses and was squashed! Quaker Sam then began printing on all of the pages that came after the weather page in the newspaper. When he looked up, he realized he was on the front page of the educational section, where he could be cut out and mailed all over the world, just like his buddy Flat Stanley. Quaker Sam would be very sad if no one sent him on any adventures to far-away places and hopes to read about the wonderful places he visits in a future edition of the Salem News. 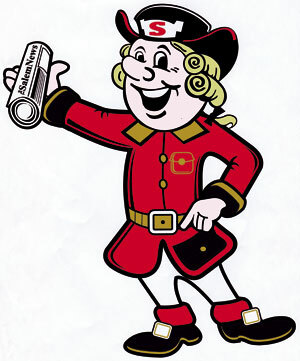 Because Quaker Sam works for the newspaper, he can track his progress on the newspapers website, www.salemnews.net which can be accessed from all over the world. While there readers can post their photos of Quaker Sam and read where he has been. “However perhaps the greatest benefits to taking part of the Quaker Sam projects is that it allows students to share important facets of their lives with others and to become a real community of learner that care about one. So often, kids want to talk with classmates and teachers about meaningful events that occur outside of school. However, in trying to meet the demands of a rigorous curriculum, unfortunately, sharing is often put on the back burner. By keeping a daily journal of Quaker Sam adventures in their home and having a set-aside sharing time, our students now have a forum where they are able to share with one another the news they care about, whether it be the slumber party they just had, update on pets or maybe family excursions. I'm a firm believer that if you allow kids to share, then they know other have an interest in them and care. Once kids know people care, then the flood gates are open to learn even more throughout the day and educational opportunities become limitless." Parents, guardians and teachers, please help your child cut out the Quaker Sam figure on the top of the page. Children can practice letter-writing skills by mailing Quaker Sam to people all over the world. When friends and family members take photos of themselves with Quaker Sam, the photos can be posted directly to our website www.salemnews.net under the “Quaker Sam Adventures”link. Or, Quaker Sam photos may be mailed to Salem News c/o “Quaker Sam” Newspapers in Education 161 N. Lincoln Ave, Salem Ohio 44460. Please include the child's name, age, school and a phone number, along with a short note about where Quaker Sam has traveled and who he has met along the way. The Salem News website also will feature photos of Quaker Sam's activities, so check back often to see where he's been! Also, watch for an upcoming story in the newspapers in education section detailing more about Quaker Sam's where abouts!